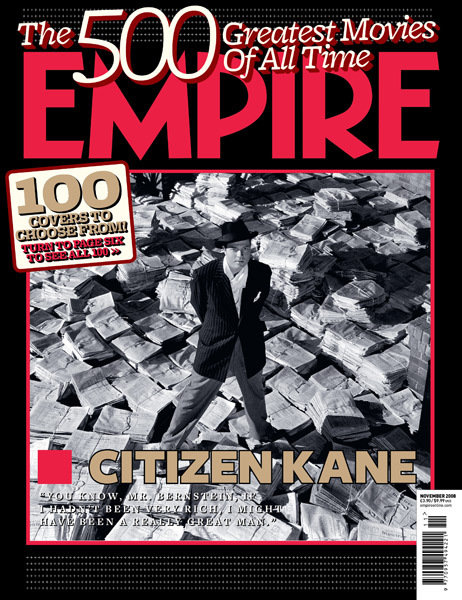 Having finally viewed Citizen Kane, I am left wondering what it is about that film that supposedly made it so great? Only recently toppled from #1 on many lists of the top 100 films, it clearly had legs. I just could not see them. Well, anyway, it’s a tick from the list. It’s actually difficult to find a top 100 films list that we want to work with. Many of them are solely American films, others voted on by present day film-goers tend to be slanted towards the newest blockbusters. I lean mostly towards Empire’s 500. This list at least encompasses the output from beyond the Americas. Oddly, #2 on the 500 list is Raiders of the Lost Ark. I have seen it many times and it is undoubtedly a lot of fun… but is it really a great film? I’m not sure that I would have voted it so. I mean, Harrison Ford was well hot, but he’s never going to be judged on of the world’s greatest actors, is he? Similar comments apply to ‘#3, of course, The Empire Strikes Back. The Shawshank Redemption at #4 is a long-time favourite of mine; it is followed by Jaws. Now, I have certainly seen some of Jaws, but am not sure that I have ever sat all the way through it. I found it to be tripe. Numbers 6, 7, and 8 I have seen but Pulp Fiction at no 9 is yet to be watched. Another one that I have avoided to date. I have seen number 10, Fight Club and thus we come to number 11 in the list before finding the next “to be watched” film and again, it is one that I have actively avoided: Raging Bull. Funny, I had expected this part of my education to be fun and enjoyable – but Tarantino, Marlon and Sly are not my idea of watchability. Ho, hum. It is looking like the holes in my film education are self-selected! I had intended to go to Kirkwall today as I cannot go tomorrow, we are expecting a visitor from America at Spinning and I cannot miss it. A call from my GP, making an appointment for this morning rather messed up my plans. He is referring me to a cardiologist as a non-urgent referral. I need to get bloods done for fasting blood sugar and for cholesterol and lipid profiles etc. This I shall probably get organised for next week some time. Between now and then I have a little job to do for the doctor. Some time ago I was involved in producing a booklet aimed at enticing a new doctor to our island. The doctor that was appointed was very impressed by the publication and now wishes me to update it in order to seduce a District Nurse. If there are any nurses out there fancying a quiet island life, consider this a heads-up. An earlier version of the booklet is available for download on the Sanday community website under the Live and Work section. Right, I need to get my bobbin filled and my wheel set up for spinning group tomorrow. Tempus fugit. Many of Empire’s readers are male. I think this is demonstrated in the lists of films. I like a good action film, but I prefer films that make me think. Shawshank is one of my top films. Great Escape and Thomas Crown Affair (Pierce Brosnan remake) are also in the top 5. I find modern action films very boring. Those crash scenes that go on and on and on and on… though there was one of those in the 3rd Bourne movie and I still enjoyed that 😉 Shawshank is great, and the Great Escape is indisputable but I’ll take Steve McQueen over Pierce Brosnan any day (though that’s ‘cos I’m old and sentimental) and now I shall be humming “Windmills” for the rest of the day. Noel Harrison was pretty cute too, come to think of it. I’ve not actually seen the remake, though I have suggested it to Mr L on a compare and contrast basis. Perhaps we shall get around to it. I still haven’t seen Citizen Kane. We have the DVD ready for one day. I’d say that it was not worth the bother but.. as a period piece and to complete one’s film education, I suppose it had to be done. I only dropped off once, so it cannot have been too dull.